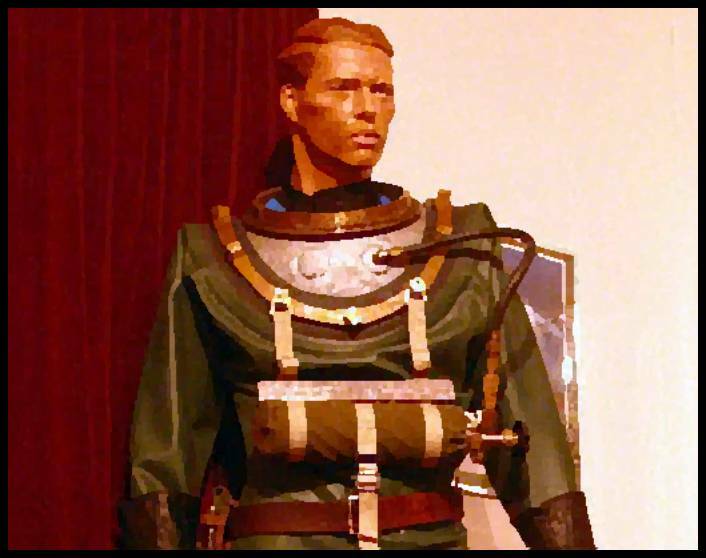 How I replicated the diving suit worn by Captain Nemo’s Crew. 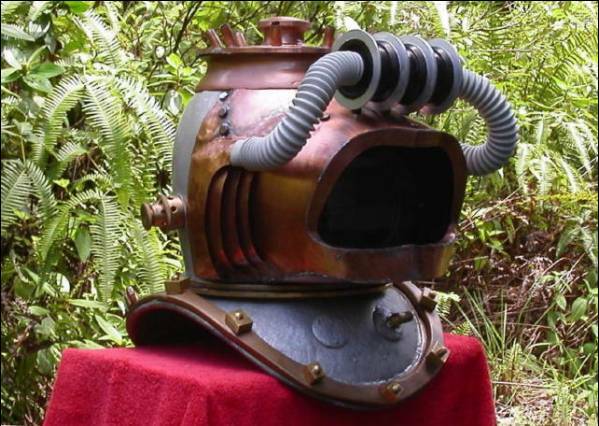 In this screen capture from Disney’s Making Of documentary, we see an early prototype of the Diver helmet. Compare this to the movie version to see similarities and differences. 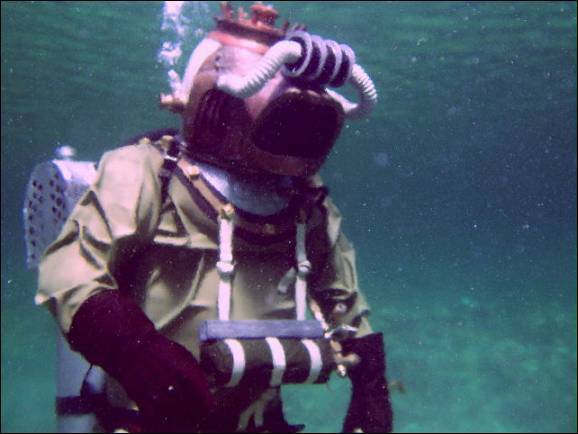 Another screen capture from the Making Of documentary: this time showing the diver in a Crewman’s suit. Still some differences between the movie version, but we can see the developmental process at work. 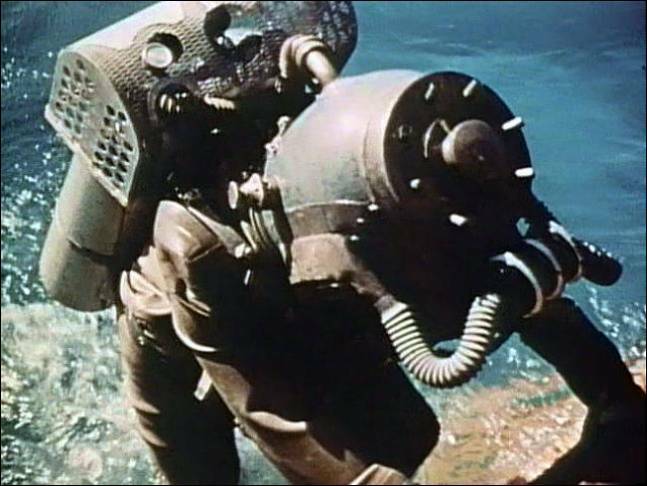 In this screen capture from Disney’s OPERATION UNDERSEA, we get a look at one of the actual divers from the movie, climbing aboard the barge after filming a sequence for the movie. 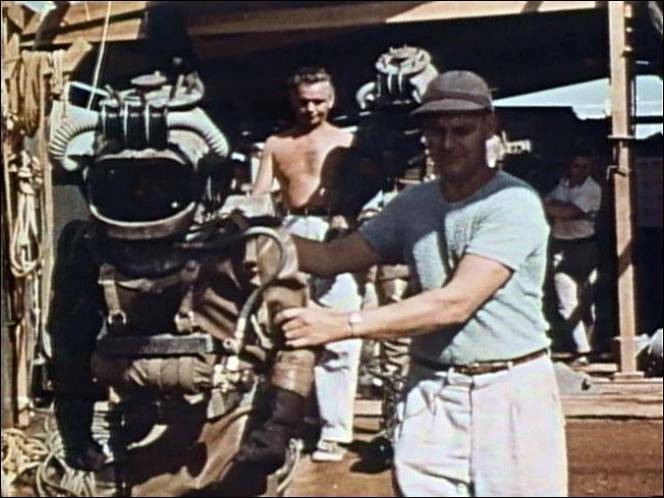 Again from OPERATION UNDERSEA: assistants help the divers to the ladder at the start of a dive. The Disney rigs were extremely heavy, and insurance against a fall on deck was necessary. 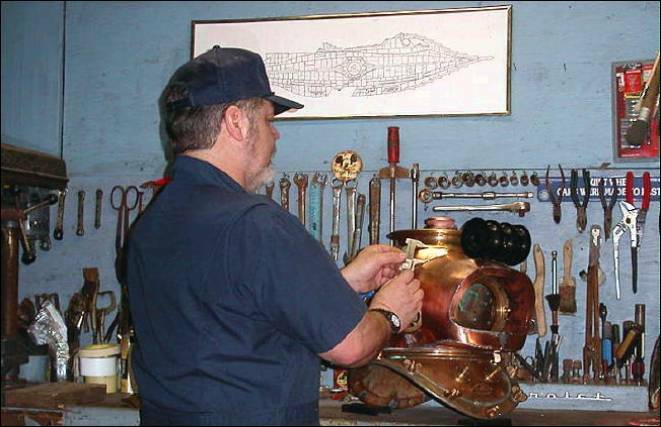 In the shop, Pat works on the NAUTILUS DIVER replica helmet. 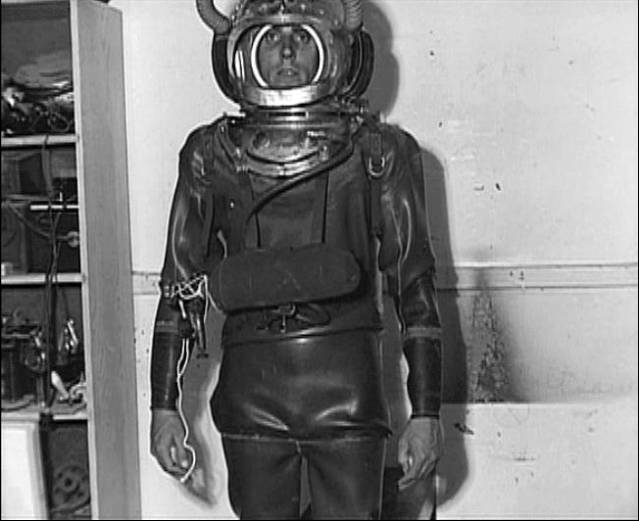 Checking the fit on the newly-arrived AQUALA drysuit for the DIVER project. On the workbench in the shop, we see several helmets in various phases of completion. 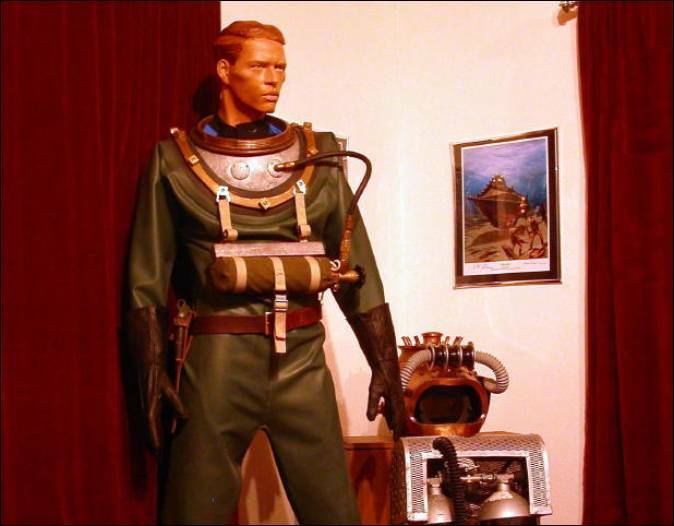 Some of these are fiberglass replicas; others are functional diving helmets. 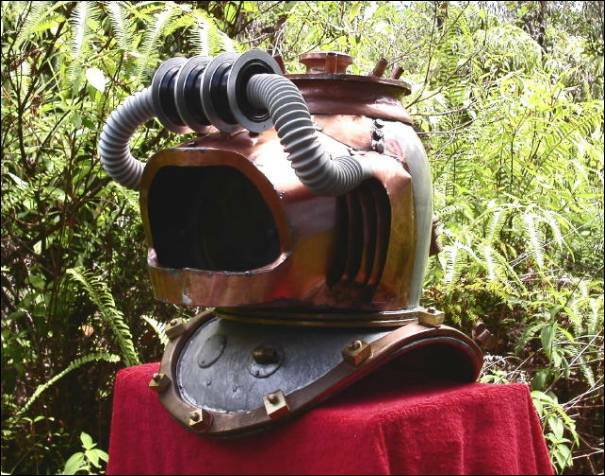 Here’s an in-process shot of the NAUTILUS DIVER helmet during a phase of its construction. 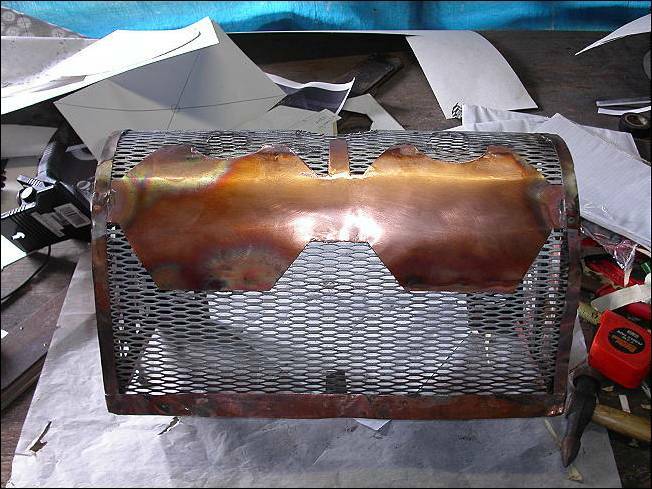 This is an in-process shot of the regulator fairing under construction. 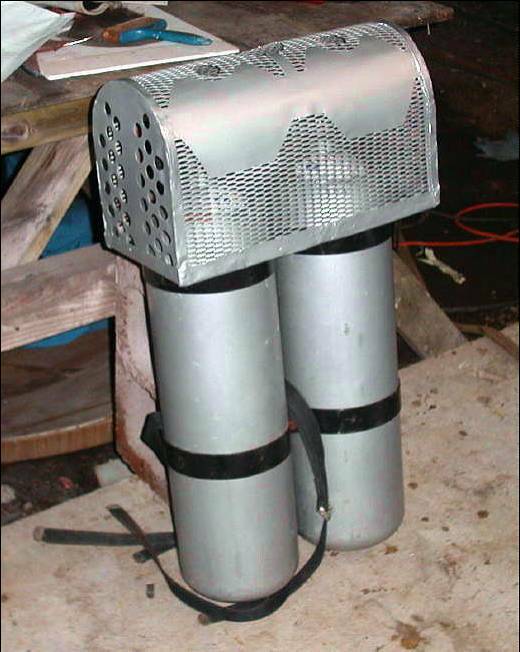 The completed regulator fairing in place on the DIVER tanks. 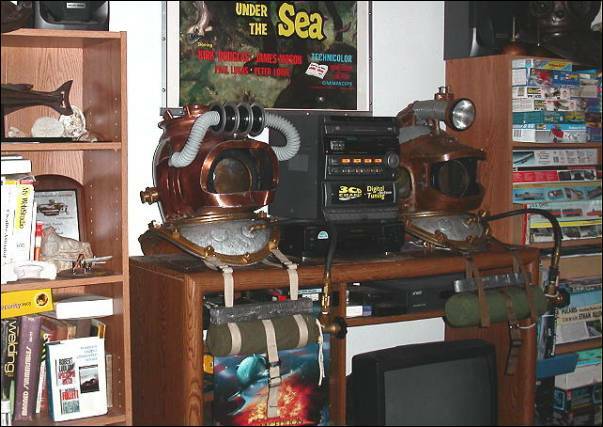 Except for a little detail painting, and the faux “valve knobs” that sit on top of the “cage”, this rig is ready to dive. 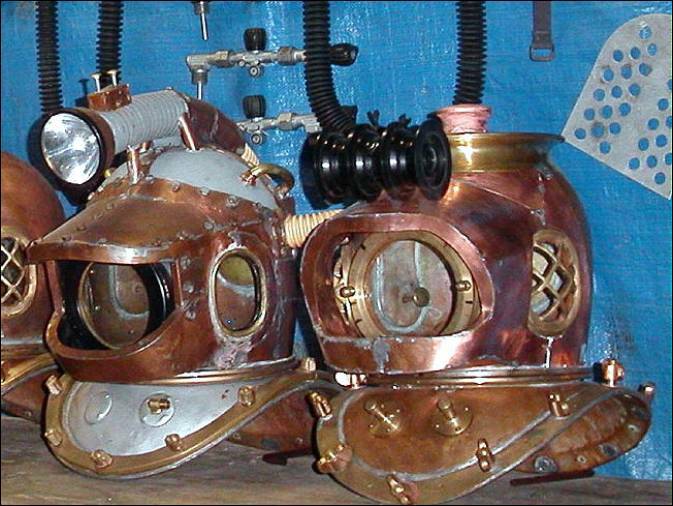 NEMO and DIVER helmets in the shop. 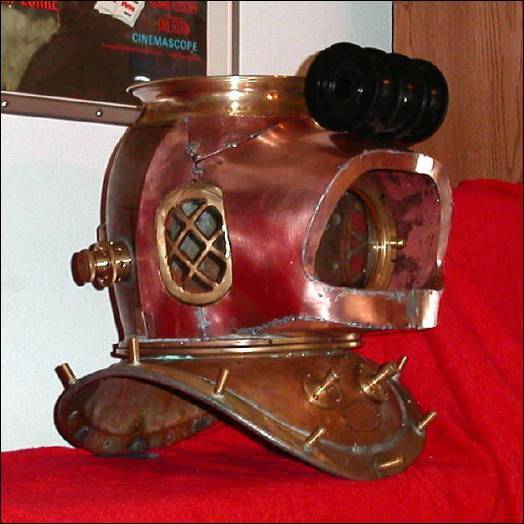 Here’s an in-process shot of the DIVER helmet with the “gills” and hoses tacked on. Everything’s held together with tape at this point while I experiment with making things fit. I still have to modify the breastplate. And the knob on top is wood; the final “crown” assembly will be made of copper. 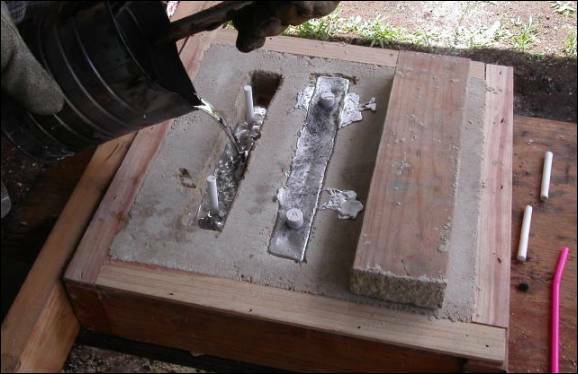 Pouring molten metal into a high temperature mold. 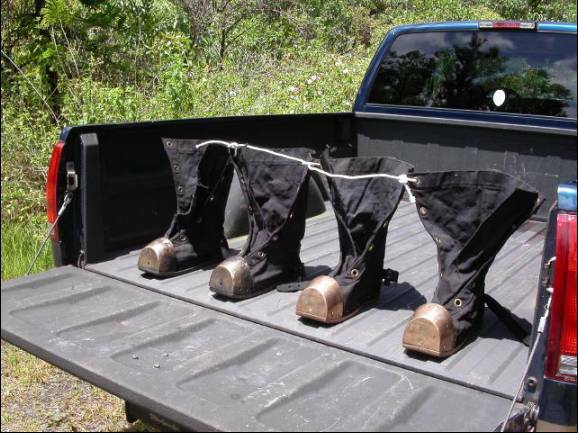 High top MORSE diving boots, dyed black and drying in the sun in the bed of my truck. 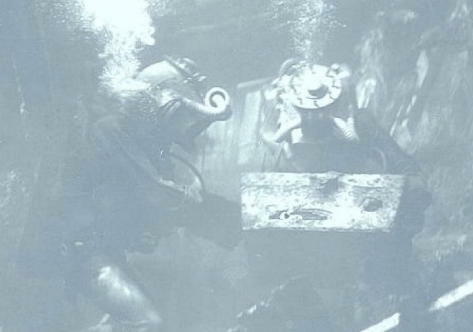 Two of the SCUBA tank weights from the NEMOSUIT, and a wooden plug for the NAUTILUS DIVER pony bottle weight, are positioned in a sand casting mold. Pins retain the position of holes, to maintain uniformity with the standardized tank mounting bracket and pony bottle harness strap spacing. 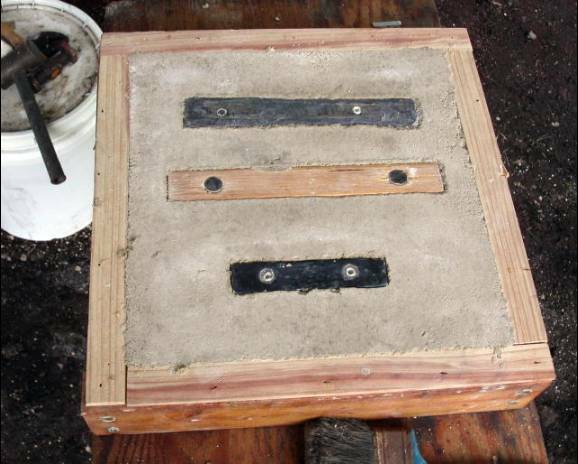 After the weights and plug are removed, the pins are replaced with sticks of chalk and plaster. 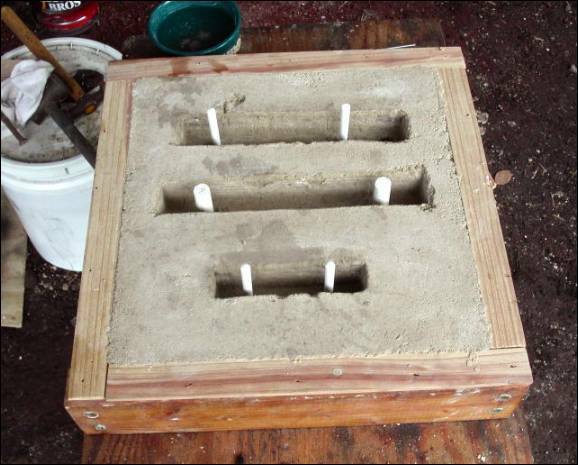 These will keep the holes clear and eliminate the need to drill holes in the lead: a work saving procedure. 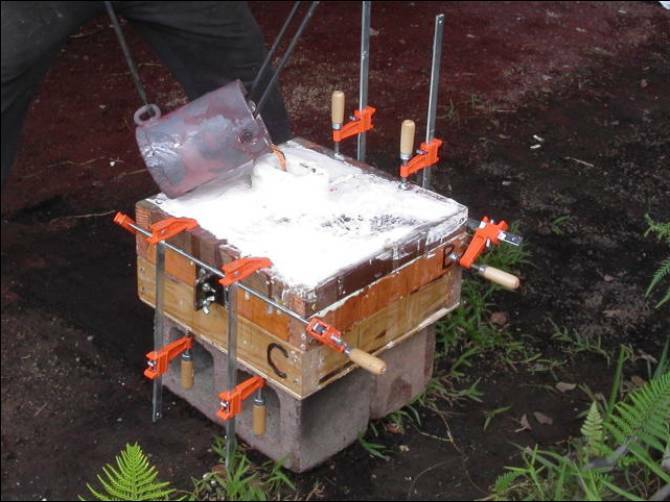 Heated in an ordinary coffee can, molten lead is poured into the mold. 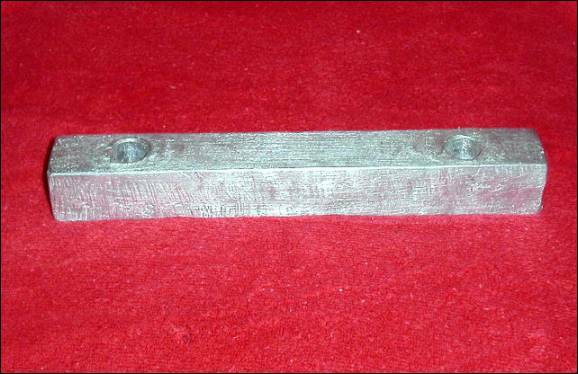 The final result: a finished lead weight for the pony bottle. August 07, 2004. Except for a couple very minor details to be taken care of in the next couple days, the NAUTILUS DIVER project is complete. 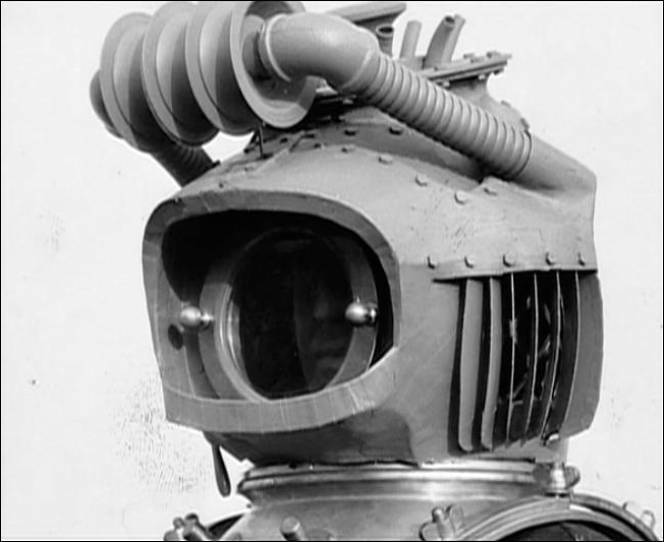 I’ll be documenting earlier aspects of the work on this page in the near future; meanwhile, here’s a preview of the completed helmet, ready to dive. Our entertainment center becomes a staging area for helmets and tanks. 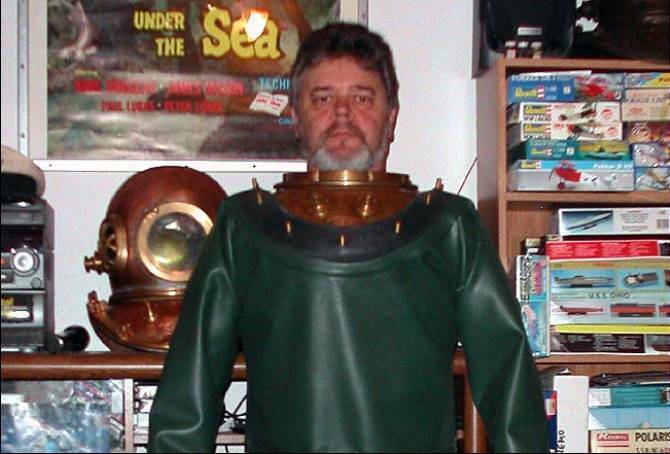 As she did for the NEMOSUIT project, “Mrs. 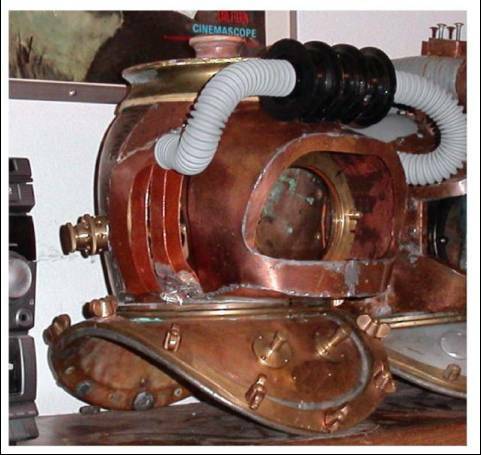 Nemo” (Lynn Regan) sewed up the NAUTILUS DIVER reserve air tank carrier from scratch. 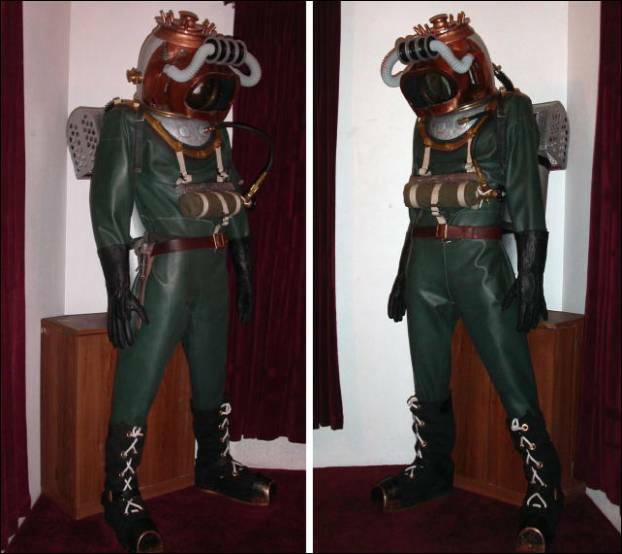 Two views of the just-finished NAUTILUS DIVER. A closeup view of the display taken during the daytime under natural lighting. 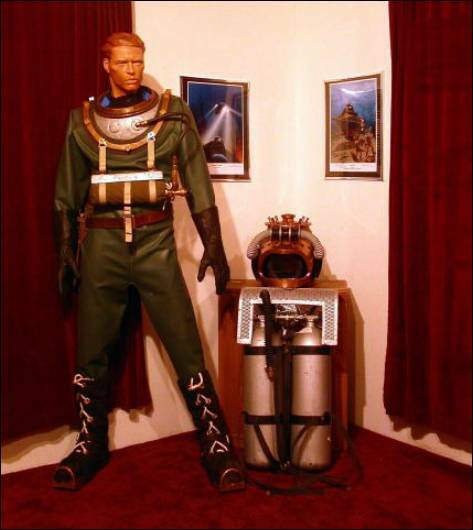 Another view of the “Getting Suited Up” display. I created this NAUTILUS DIVER “painting” with computer graphics. 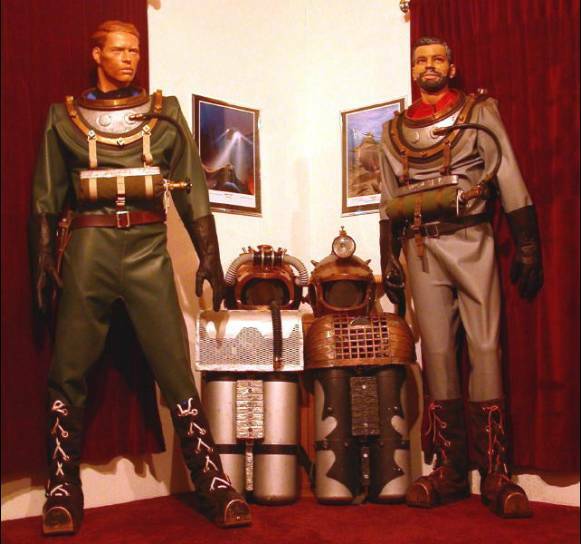 The NAUTILUS DIVER and NEMOSUIT: Lifesize, fully functional replicas of the diving suits created by Harper Goff and the Disney Art Department for 20,000 Leagues Under the Sea. 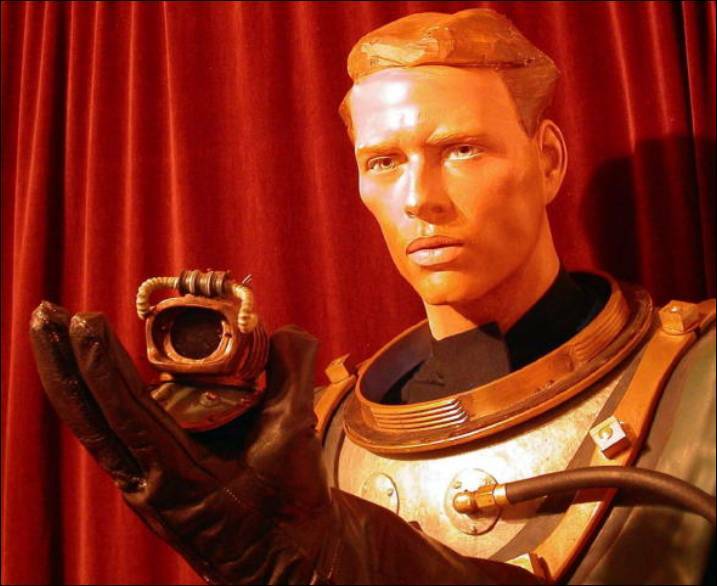 NAUTILUS DIVER and Disney commemorative miniature helmet. 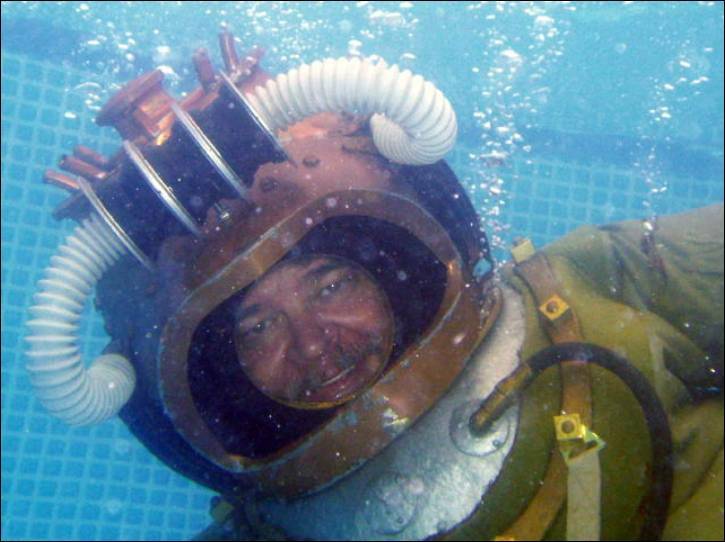 Successful pool test of the emergency air system. 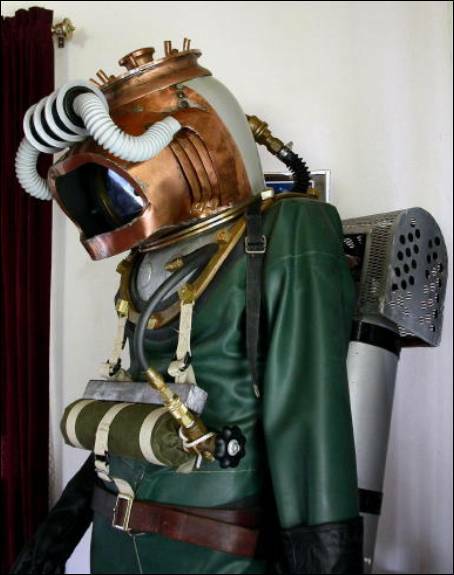 Nautilus Crew Diver in the ocean, Hawaii 2007.